Nils Norman’s Public Workplace Playground Sculpture for Graz, 2009, jumbles our expectations of what public sculpture can be today. 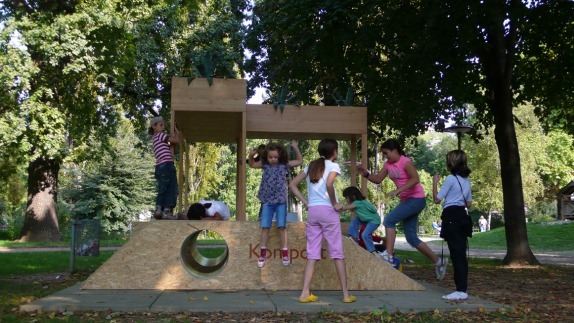 Its title and look immediately announce the piece’s contradictory status as a workplace design, combined with the look of a roughshod playground for children, categorized as a sculpture, situated in the midst of a park! 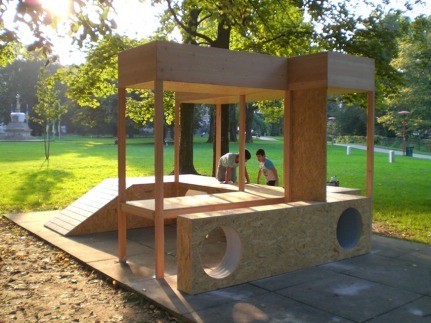 What appears striking is the project’s mind-boggling merging of functions (work and play), typological categories (artistic sculpture, office furniture, DIY-construction), intended users (children, business people, recreational visitors), and spaces (public and private). By joining these paradoxical qualities together in a bizarre, composite object, the work enters a utopian dimension by momentarily suspending all social and political contradictions implied by those qualities. But like all good uses of utopia—in contrast to the regressive, nostalgic, escapist versions—Norman’s piece rebounds reflexively and critically on reality by literalizing and exaggerating its ideals. One important point of departure for Norman’s work—which is informed by the artist’s ongoing research—is the recent reconceptualization of office design within the New Economy (the post-manufacture financial system of globalization based on services and information technology). Unlike older plans for offices—based on cubicles, hierarchical layouts, and privileged zones of access—recent designs of the 1990s and 2000s aim to inspire fluid social interaction amongst workers, engendering cross-disciplinary communication in the name of creative innovation, efficiency, and of course the maximization of profit. The resulting design aesthetic typically emphasizes the flexible open plan (as in loft architecture), which combines uses of space and strategically situates social areas to facilitate exchanges within and between office members that will lead to collaborative solutions to business problems. That same logic rules Norman’s adaptable and interconnecting construction, which merges areas for heterogeneous functions—desks for laptops, ramps and holes for play or sleep, plants for meditation, a composting unit and rocket oven for recycling and eco-awareness—thereby creating a mixed-use structure that joins disparate social systems. In other words, Norman adopts the aesthetics of the New Economy’s office design in order to model an equivalent form of public art on that basis. Such design ideas have also guided recent proposals for the reinvention of public space, as advanced by urban studies theorist Richard Florida and his notion of the “creative class”—a further reference, and frequent target, in Norman’s work. According to Florida, successful cities—those that demonstrate consistent economic growth—possess a high “diversity index,” one that measures dense concentrations of “high bohemians,” comprised of high-tech workers, artists, musicians, lesbian and gay men, whose culture correlates with an open, energetic, and professional environment that promotes long-term urban prosperity. Rather than invest in costly and unsightly infrastructure, such as sports stadiums, spectacular buildings, and shopping malls, urban planers with ambition, in Florida’s view, should make their cities attractive to the creative class; economic success will then follow. 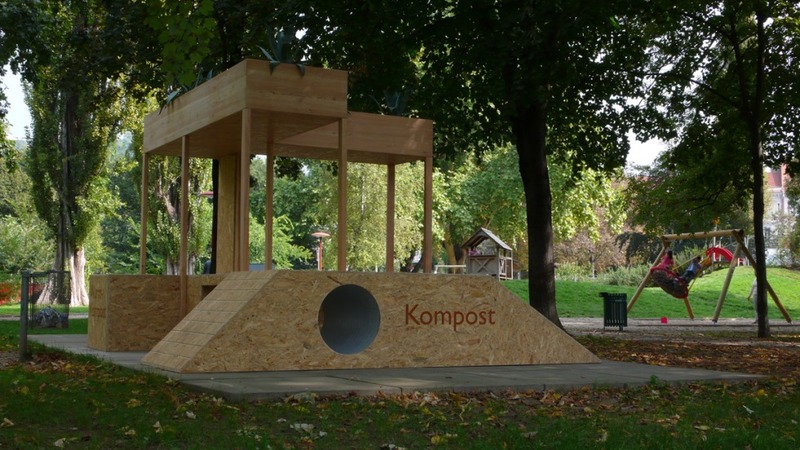 Norman’s sculpture mirrors these imperatives too, proposing a kind of monument to the current-day utopian vision of entrepreneurial capitalism, referencing its ideals of social creativity, ecological consciousness, and knowledge exchange. 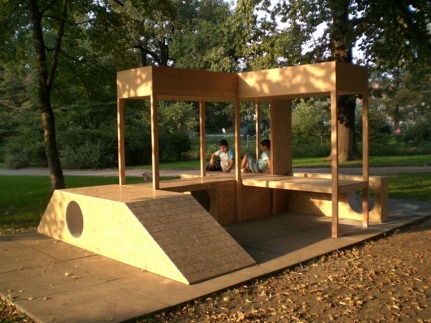 One fundamental aspect of this contemporary ideology is its belief in profiting from every second, which the Public Workplace Playground Sculpture anticipates: When an idea arises on the walk home, for instance, why not sit down at the “hot desk,” discuss with others, and work out a creative solution on your laptop? And when you’re tired, why not take a power nap in the crawl space? There’s room for kids if necessary. Norman’s sculpture thereby images the ultimate all-in-one activity center that maximizes productivity and potentializes the moments otherwise lost to distance, travel, and disorganization. In this sense, given its use of constructivist form, Norman’s sculpture suggests a current-day equivalent to Tatlin’s Monument to the Third International, 1917, recalling the exemplary Soviet utopian model dedicated to communism. Only now, in Norman’s version, it has been appropriately reformatted to the needs of neoliberal capitalism, which has already appropriated the communist principals of social participation for its own purposes, just as Soviet aesthetics were co-opted in turn by minimalism and post-minimalist design—further contradictions visible in Norman’s work. Yet the sculpture’s redeployment of these capitalist ideals soon takes on critical tones, as its utopian elements begin to unravel and to backfire strategically. First, the incongruity of the design’s intended functions quickly becomes apparent. To combine children’s play with office work, for instance, is in fact far from the corporate ideal of labor (even if the proposal is nevertheless an interesting one, particularly for those able or needing to concentrate on work while children play independently). 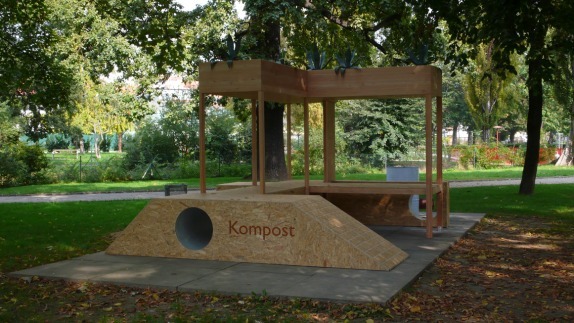 Second, insofar as the rocket oven and worm composting unit—the presence of which are suggested in Norman’s Graz prototype—reference the cultures of homelessness and DIY environmentalism, they clearly contradict capitalist interests. Of course, the capital thrives on the appropriation of the non-productive, which is clear in corporate greenwashing campaigns that adapt ecological commitments to market imperatives. But homelessness defines a longstanding problem for urban planning, leading to “defensive architecture” that seeks to minimize the presence of undesirables via creative design solutions (e.g. benches that physically forbid sleeping)—indeed the Public Workplace Playground Sculpture’s “play lean” references precisely this element. That said, to join these elements directly, without mediation, is to invite consideration of the strategy’s dubiousness—as if urban planning can really resolve social conflicts, as much as social engineering or interior design can guarantee a city’s or business’s success. In this regard, Norman exposes the grotesqueness of the New Economy’s appropriation of sub-cultures—whether environmentalist, gay, bohemian, or artistic—for by co-opting and internalizing their styles and forms, the creative class neglects, or violently eliminates, the oppositional energies attached to them. 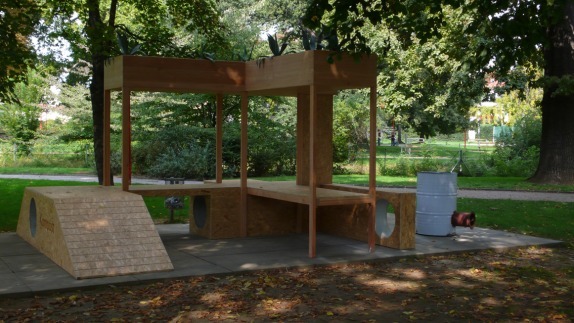 A further contradiction is the sculpture’s location in public space, a siting that defies the recent trend of the privatization of urban design by corporate architecture. Once, urban theorists like Jane Jacobs celebrated social diversity and connectivity in dense, tightly-knit areas as the qualities of the ideal city—as evidenced in her native Greenwich Village neighborhood of New York City during the 1950s. But today those very conditions have been instrumentalized by corporate culture, given over to their demands for social creativity, whereas public space has succumbed to banal commercial activity surveilled and disciplined by high-tech security and defensive architecture.6 If the New Economy’s office layout has appropriated the dynamism once obtained cooperatively and freely in the public realm, it has drained that social energy from the commonwealth only to turn it into a private resource and commodity. 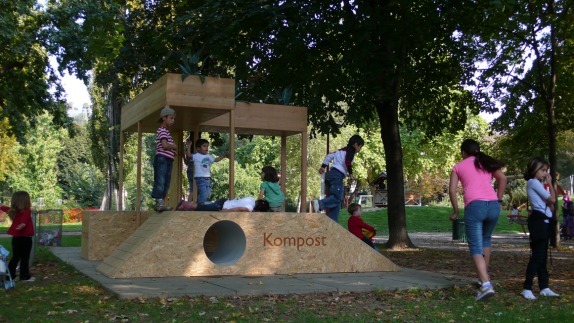 By situating his Public Workplace Playground Sculpture in a public park—the Volksgarten, or People’s Garden, no less—Norman’s deeply ironic gesture thereby makes an urgent and radical demand: to rethink and reappropriate the creative and collaborative potential of recent economic transformations as a public resource outside of and beyond neoliberalism. Or is that demand the real utopian aspect of his work?